Extra Virgin Olive Oil: Exceptional quality, aroma and taste. The oil is from the first pressing of the olives with no chemicals or hot water added during processing. Acidity up to 0.8 percent. About 70 percent of Greece's olive oil is "extra virgin." Virgin Olive Oil: Also from the first pressing, the quality is not quite as exceptional. Fine aroma and taste, acidity up to 2 percent. There are also several lesser grades. Green oil is most likely a product of green olives, harvested before ripening, and is highly prized by many. Golden-yellow olive oil is generally the product of olives that have been allowed to ripen longer. Both green and golden-yellow oils can be extra virgin oils. Olive oil can also be cloudy if it has not settled, which is not an indication that it's poor quality. A bitter or sharp taste usually indicates that the olives were not ripe when picked. Oil made from ripe olives has a mild, fruity taste. Taste is entirely a matter of preference, and oils made from both unripened and ripened olives have wide appeal. If an olive oil smells bad, don't buy it or use it. Rancidity caused by oxidation is the most common reason for a bad smell, and it causes the oil to smell like dirt. While the International Olive Oil Council allows acidity of up to 3.3 percent for human consumption, consumers should look for acidity levels under one percent and lower in an extra virgin olive oil. Acidity affects the taste and is a determinant of quality. To be assured of excellent quality Greek olive oil, read the label. It should be clearly marked "Extra Virgin Olive Oil," and acidity levels will be at or below 0.8 percent. Look for the area or region where the oil was produced, and verify that it is, indeed, from Greece. Try buying more than one olive oil in small containers to taste and experiment. You may find that taste (and price) differs in extra virgin olive oil (and other grades) from brand to brand, even when the color looks the same. Shop smart, and shop Greek! 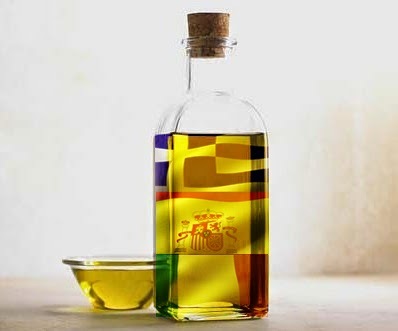 Olive oil used for making dressings and sauces, and drizzling over fresh vegetables, salads, and cheeses should be fine quality extra virgin Greek olive oil to allow full enjoyment of the exceptional taste and aroma. For high heat cooking, where the aroma is degraded, consider a lower grade (and less expensive) olive oil. Don't be deceived by the lower price and think this is a good alternative. It is my personal opinion that olive pomace oil should not be used for cooking. It's made from a combination of olive residue oil and virgin olive oil, and the quality is poor. Αναρτήθηκε από Unknown στις 8:20 π.μ.